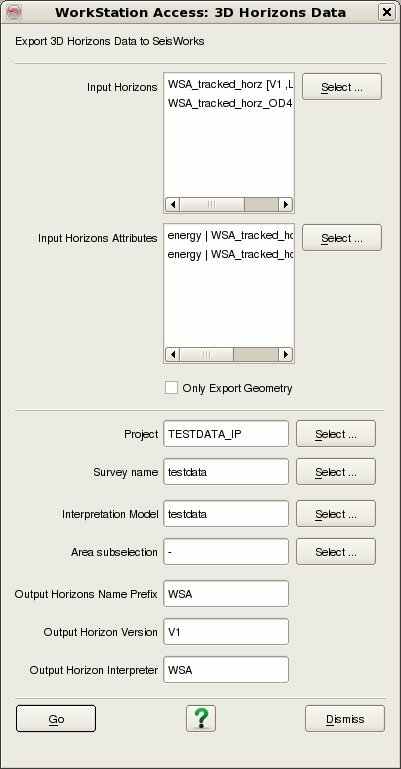 To export 3D Horizon data, select Survey - Export - Horizon - SeisWorks - 3D. The top part of the user interface corresponds to the OpendTect access, where it is needed to select the Input Horizons that you wish to export (For multiple selection of horizons hold the Ctrl key while selecting). Further, you can select the Input Attributes from the selected Input Horizons that you wish to export, but if you only want the Input Horizons geometry then tick the box Only Export Geometry. The bottom part of the user interface corresponds to the SeisWorks access, where it is needed to specify the SeisWorks Project, Survey name, Interpretation Model, and the Output Horizon Name for the case of a single horizon export or the Output Horizons Prefix for the case of multiple horizons export, together with the Output Cube Version and the Output Cube Interpreter. Optionally, you can select the full volume or a sub volume by using the Area subselection option. Note that, when exporting a 3D Horizon into SeisWorks, the geometry and attributes of the selected Input Horizons from OpendTect are separated into different 3D Horizons. Horizon data are selected by four data keys, Name, Version, Attribute and Interpreter. The data selection dialog also displays the Created by for information only. To select an existing Horizon from the list, just select it and its Name, Version, Attribute and Interpreter will appear in the appropriate text-fields. 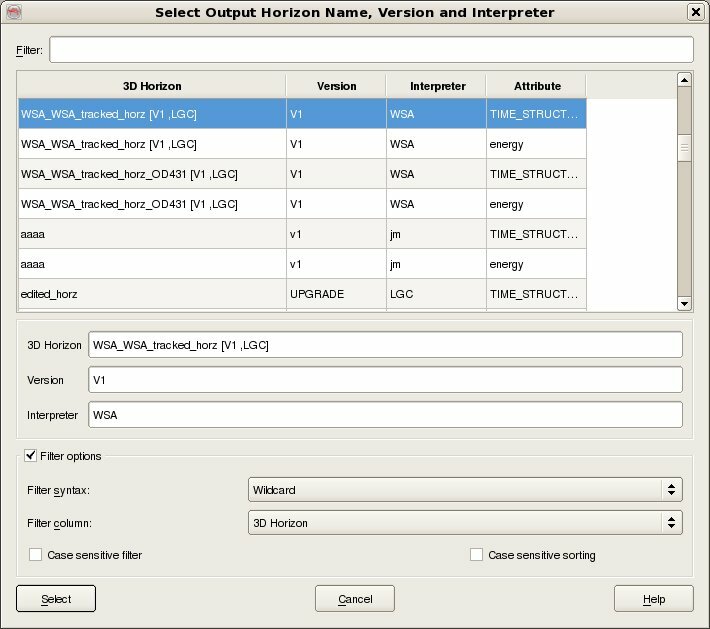 To create a new Horizon the Name plus Version plus Attribute plus Interpreter combination should be unique to the horizon catalog for the selected survey.. All four data keys must be supplied before the Select button becomes active. To filter the list enter the required Filter into the text field at the top. It is possible to filter on any of the five available columns by changing the Filter Column to whichever is desired. The default Filter syntax is Wildcard which means that the list is automatically filtered to only list items who's Filter Column includes the string entered into the Filter field. Other Filter syntaxes supported are Fixed Field and Regular expression. Case sensitive filtering and Case sensitive sorting are also optionally supported.